Kundalini is the primordial energy in human beings. Kundalini represents the dormant unused potential of the brain. There have been various practices in vogue in ancient civilizations across world to awaken this Kundalini Shakthi. Many of them are lost with time and we understand glimpses of them in the rock carvings and excavations. Yoga has well documented and focused practices that help humans awaken their Kundalini. Chakras are the storehouses of energy located in various parts of the human body. However there are specific chakras situated on the spinal cord which are used to manipulate and activate the kundalini shakthi with various yogic practices. At Gurudarshan Ashram located in the serene country side of South Tamil Nadu some of the practices are taught that help the students explore and understand their chakras and experience this mystical energy. Gurudarshan ashram is located in an idyllic place about 130 km south of Chennai in a 4.5 acre campus. It is in between and close proximity to spiritual centres like Tiruvannamalai and Puducherry. The training is from 1st to 6th March, 2015. During these 6 days, we will introduce you to your own Chakras. We will also prepare you for a higher kundalini practice called Kriya Yoga. The trainings are based on Satyananda Yoga tradition established by Paramahamsa Swami Satyananda Saraswati, with a good blend of theory and practice of Yoga besides opportunities for the students to take part in ashram activities by means of Seva(service). The classes will be conducted under the direct supervision of Sannyasi Krishnayogam (disciple of Paramahamsa Swami Satyananda/Niranjanananda Saraswati) who has 3 decades of yoga teaching experience. The trainings are based on Satyananda Yoga tradition with a good blend of theory and practice of Yoga besides opportunities for the students to take part in ashram activities by means of Seva(service). 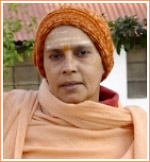 The classes will be conducted under the direct supervision of Sannyasi Krishnayogam (disciple of Paramahamsa Swami Satyananda Saraswati) who has 3 decades of yoga teaching experience. Participants will be provided with sharing, simple and clean living space. Simple and satvic but tasty Indian vegetarian food will be served. Most of the produces are coming from our own organic farm.